Home is a warm and fuzzy feeling. While the world is busy catching up on makeup tutorials and vlogs on YouTube, I don’t know what is up with that. I pretty much do the same, but every now and then I follow interior designers and home decor on Pinterest and YouTube. Particularly those which can be incorporated into our home on a tiny budget. Being a lifestyle and wedding blogger, sometimes monotony can be a devil, and so here I am sharing something I love. 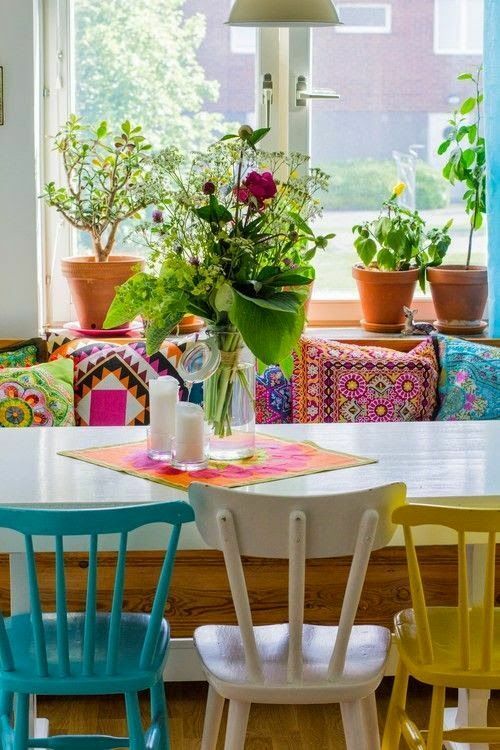 If you are a decor enthusiast and are looking for some simple hacks to turn your abode into a boho chic home, then keep scrolling. # Cushions are life ! From regular sizes to one-off statement cushions, the variety is huge and there is so much one can do with this. My favourite recently is adding pom-pom lace to the cushion covers. Cost: INR 20 to 30 for a 2-3 metre roll. The best option is to buy something Rajasthani which is very similar to this. They are easily available, inexpensive and one can tie in the colours with any sort of decor. These are super easy to make and are perfect on days when you are procrastinating. Use a colourful wall, or simply use the mandala art to highlight an otherwise empty wall. There are lots of mandala tutorials online. Some are easy, some are not..but loads of options to choose from. Rustic is trending in home decor, and if you want to up the quotient of style in your home, a bright pop antique mirror is just the trick to use. You can find these in local markets in your city and can get it painted based on the colour you like. A tricky one. But can add volumes to any home decor. I have seen beautiful traditional as well as quirky rugs in Dilli Haat. They do cost a bit but look amazing. If there is one investment you want to make in your home, that can change the whole look feel it’s a nice rug and the perfect lighting! Lighting in a house is everything. There are so many different ways to play with this accessory from mood lighting to functional lighting, floor lampshades to hanging lights and more. The possibilities are endless. If you want a one of a kind piece unique to your home, try to DIY it by using either a rope or jute fabric to get that boho yet Indian look. To add an extra glam touch to your living space, a statement dresser can go a long way. These accessories are conversation starters and look amazing as a standalone piece against any wall. Adding some greens can spruce up any corner of your home. The easiest to manage are succulents which require minimal maintenance and last for a long long time. You can find these at your closest nursery in your city.